This past weekend was "Museums on Us", from Bank of America and I finally decided to take advantage of this great deal! The first weekend of every month, Bank of America and Merrill Lynch card holders get free admission to a handful of museums across the country. They have the full list of museums on their website. 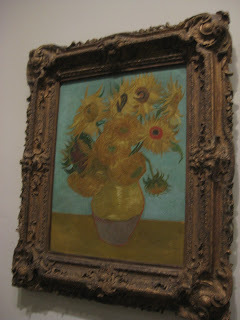 Among the permanent collection, you can find one of my favorites, Sunflowers by Van Gogh. My reasoning for going to the Philadelphia Art Museum(PAM) first was that regardless of BoA weekend, when you purchase a ticket to the PAM, you also gain entrance to the Perelman Building as well as the Rodin Museum. So, on top of all the free museums, thanks to BoA, you're getting two more for free! What a deal! After frolicking around the PAM, it was time to head over to the Rodin Museum, which I've never been to before (in Philly at least). We hopped on the museum's free trolley which can be picked up at the West end of the PAM. Make sure to be aware of the times in advance so you can plan your frolicking time accordingly. The trolley dropped us off right in front of the Rodin Museum. The first thing you get to see is Rodin's famous sculpture The Thinker! The garden outside the museum is just as enjoyable as the inside! It may not be in France but it is just as magnifique! While inside the museum, look for Jennifer Parker, the Visitor Services Manager, she'll give you some great insights into the world of Rodin's art. I'm not going to share all the juicy details with you here, you are going to have to find her yourself! What museums did you go to during Museums on Us weekend?